Just as they sound, a seamless gutter it a gutter that has no seams or breaks in the gutter. Traditional gutters consist of multiple separate sections of gutter that have been attached as one. A seamless gutter does not have breaks, making it one large piece of metal. How Do The Differ From Traditional Gutters? Seamless gutters were developed as a response to the fallacies of traditional gutters.Over time, a traditional gutter may break or rupture at one of it’s joints, resulting in a leak. Additionally, traditional gutters are manufactured in bulk, with each contractor using a different amount of stock gutter parts, depending on the size of the house or project. Seamless gutters are manufactured in the yard of the house they are to be installed upon, and are custom fitted to fit the building. What The The Benefits Of Seamless Gutters? Replacing traditional, outdated, gutters with seamless gutters is usually recommended by your contractor because of their reliability and efficiency. Not only do they greatly reduce the possibility of leaks, but they also eliminate unsightly seams. If you are in need of gutter replacement, we would strongly suggest that you consider making the investment towards seamless gutters. But How Do You Know When You Need Seamless Gutters? Some gutters can last for up to two decades, but some never make it past five years. Because if this it is extremely important to pay attention to the integrity of your gutters in order to ensure that they are doing their job correctly. 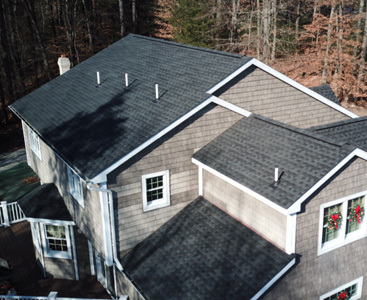 In order to ensure that your gutters are in working condition, contact us at Nice Shingles Roofing & Exteriors for a gutter inspection and seamless gutters quote if you notice the following. Cracks, Holes & Rust – If you see cracks, holes, or rust on your gutters then it is important to consider replacing them before they fail. All three damages, while seemingly aesthetic, are signs of impending gutter failure. Broken Fasteners – Fasteners are the metal pieces that secure your gutters to your roof. If more than half of the gutters fall off, or become loose, your gutters will be at a high chance of failure during storming. Hardware On The Ground Below – If you find nails, screws, or other hardware on the ground beneath your gutters, it could mean that their integrity has been compromised. Separated Gutters – Traditional gutters feature seams, where two pieces of gutter meet. If the seam separates, the gutters drainage system becomes worthless. Sagging Gutters – Sometimes gutters can begin to sag. This may occur for multiple reasons ranging from their material to the physical weight of debris in them, but if you notice you gutters sagging it might be time for a gutter inspection. Peeling Paint – Peeling paint affects the aesthetic value of your home, as well as the functionality of the gutter. Eroded Ground – The number one indicator that it is time to consider new gutters is the presence of eroded landscaping under the gutters. This indicates that the gutters are not effectively maintaining the flow of water. If you need new gutters, or suspect that you need new gutters, we urge you to contact us today at Nice Shingles Roofing & Exteriors. We will send a professional gutter installation team to your home to install seamless gutters, as well as gutter guards. Our team of Stroudsburg gutter replacement specialists are experienced, hardworking, and willing to do whatever it takes to install efficient rain gutter systems on your home. If you believe that you might need new gutters please don’t hesitate to contact us today and request a gutter inspection.